You Key West experience is not complete without at least one sunset at Mallory Square. Why not get married there? Few places in the world offer the sheer brilliance, the majesty, and the peacefulness of the Keys when it’s that special time for the sun to disappear below the horizon. 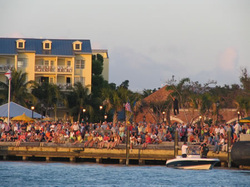 Sunset in Old Town is a time honored happening when hundreds of people gather on the docks of historic Mallory Square. Many noted figures have enjoyed the view of sunset from Mallory Square over the years. Audubon wrote glowingly of the glorious Key West sunsets while visiting in the early 1800's, and legend has it that Tennessee Williams initiated the ritual of applauding the sunset at Mallory Square, gin and tonic firmly in hand. Mallory is where you might see flame tossing jugglers, a Key West sword swallower, tightrope walkers, an exotic trained bird show and a fortune teller – all the while being serenaded by assorted minstrels and Jeep with his awesome dollar-taking puppy LottieMo. Across the footbridge you'll probably encounter some of the most intriguing and locally famous acts including Dominique and His Flying House Cats. All Sunset performers have one thing in common, they work only for the tips they earn while doing their show. If you’re hungry, food vendors set up booths offering local fare. There is no admission charge to the nightly celebration, but arrive at least thirty minutes prior to sunset to appreciate the full experience and stay after to experience the all the colors. If your wedding party is at 6 or less, Mallory Square at sunset could be an option for your ceremony. Ask us how! Parking is at a premium in all of Key West. For the Historic Seaport and Mallory, try Truman Ave to Simonton St, turn right go 7 1/2 blocks to fenced in parking lot on left side of street or turn right at next corner (Greene St) there is more parking lots there. These are convenient lots, charge $10 (cash only) per day and the attendants are helpful with directions. Also if you turn right on Caroline St and go 2 1/2 blocks on the left hand side is a nice lot that has a maximum of $16.25 per day cash or credit. If you don't use the City facilities, you will have to park at a meter on the street (if you can find one), or go to a non-city parking lot. City Parking meters are enforced Monday through Saturday, 8:00 a.m. to Midnight and Sunday, Noon to Midnight. Rates are $1.00 per hour INCLUDING holidays. Metered parking is enforced until midnight. There is a metered lot specifically for Mallory Square but unless you come early, don't expect to find a spot. Meters near Mallory Square run $3 per hour and on Duval street it's 25 cents for 10 minutes. Be sure to bring LOTs of quarters. There's also a parking garage at the Westin but icharges a rather expensive hourly rate. Key West also has several unmetered parking spaces outside the main commercial area. But be aware that about half of the spaces are marked “residential parking” and if your car doesn't have Monroe County plates or a residential sticker issued by the City, you will be ticketed there.